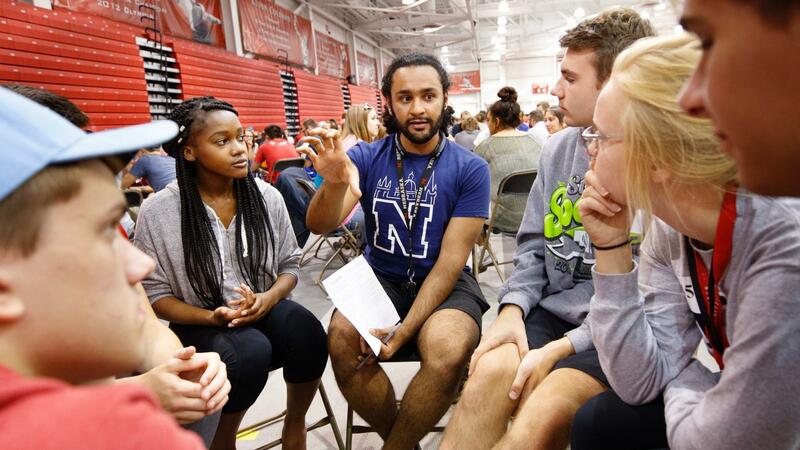 On Thursday, September 5, 2019, at 7 p.m. in the Bob Devaney Sports Center, incoming first-year students will participate in Husker Dialogues, a diversity and inclusion event facilitated by more than 370 student, faculty and staff conversation guides. Husker Dialogues is designed to introduce first-year students to tools they can use to engage in meaningful conversations to help create an inclusive Husker community. View the FAQ. 90% of participating students agreed the student stories increased their awareness of diversity in the campus community. 90.9% of participating students agreed that learning about diversity and inclusion is important in their university experience. 85.7% of participating students felt more confident in discussing diversity and inclusion issues. Students interested in participating as a Conversation Guide should sign up to attend a training session. Training session dates will be available in late spring. I thought I was an open-minded person, but Husker Dialogues made me realize that I need to open my mind ever wider about my actions and thoughts towards others’ cultures and races. I, along with many students I spoke with, want to make UNL a safe environment… and it all starts by acting and making the first move. I came away from that night with a want to contribute more to speaking up for the issues I believe in. I tend to look at a problem, be angry with it, and then hope that when I notice it again someone would have fixed it by then. I need to stop overlooking these things, in hopes someone else will have the courage to do it. Husker Dialogues card decks are available to faculty, staff and students. The questions and prompts on each card are intended to stimulate dialogue that provides an opportunity that makes discussing these issues increasingly less difficult. Sample guides with activities to help facilitate conversations in a group setting are available. If you are interested in obtaining additional decks of the Husker Dialogues cards, please email studentaffairs@unl.edu.